Combustion Research and Flow Technology (CRAFT Tech) has been using CRUNCH CFD® and Pointwise to design and evaluate pump systems for our customers. 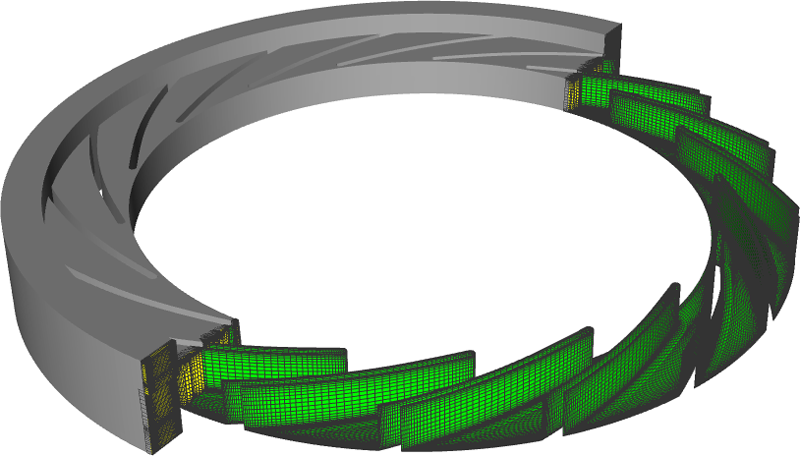 Pointwise has proven to be a robust and powerful tool for generating high-quality unstructured meshes. In particular, we have been using Pointwise's innovative anisotropic tetrahedral extrusion (T-Rex) unstructured solver extensively to streamline our mesh generation process. 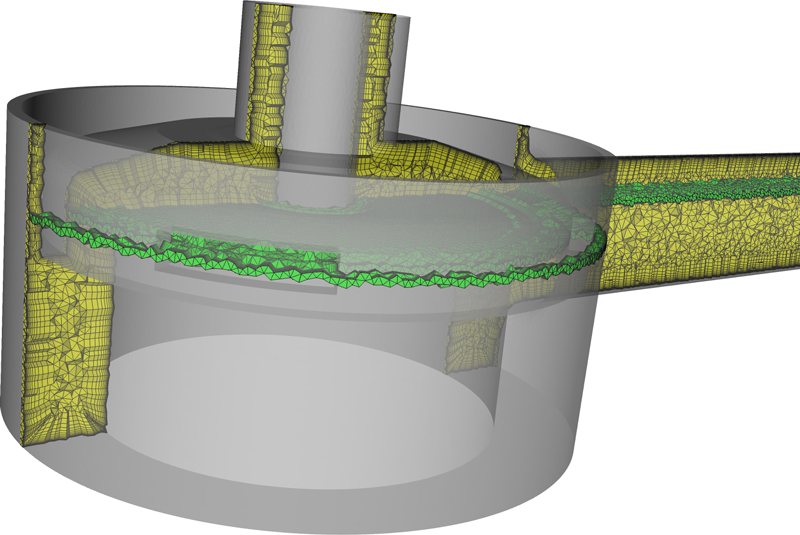 A recent case in which we took full advantage of Pointwise's unstructured meshing features is our analysis of a Low Head Safety Injection (LHSI) water pump, used in nuclear power plants. Our engineers were tasked to investigate why the pump was not performing to specification and evaluate alternative pump designs. The entire process, including mesh generation and CFD simulation, was accomplished in a matter of weeks. The resulting grid also won the Pointwise Meshy Award. CRAFT Tech's CRUNCH CFD is a numerical simulation software that provides state-of-the-art framework for predicting both single and multi-phase performance in pump applications. One key feature of CRUNCH CFD's framework is the multi-module capability. For the LHSI pump analysis, an entire stage was split into seven modules (Figure 1). This modular approach has several advantages. First, rotation can be specified for a particular component (i.e. impeller), adjacent to stationary components. 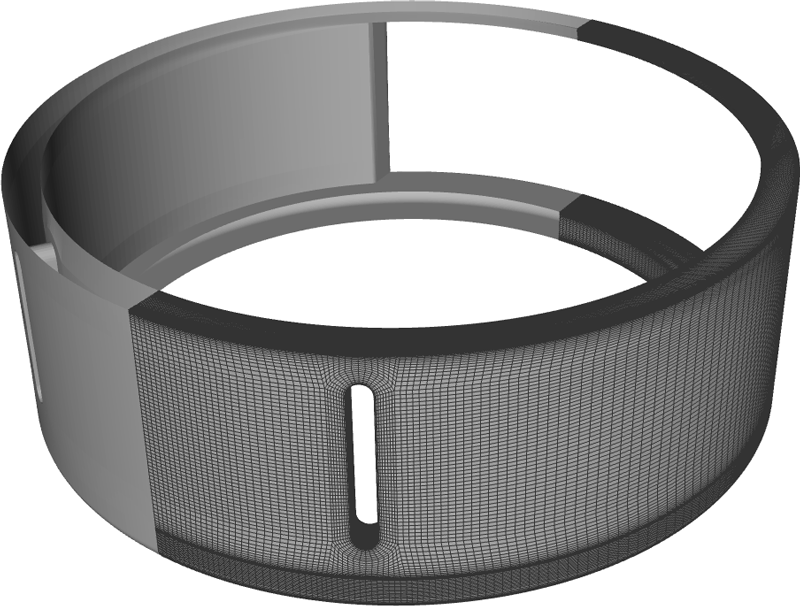 Second, a different mesh topology can be applied to each component. Flow information is passed between shared boundaries during the calculation. Figure 1: Low Head Safety Injection (LHSI) water pump split into seven CRUNCH CFD modules. 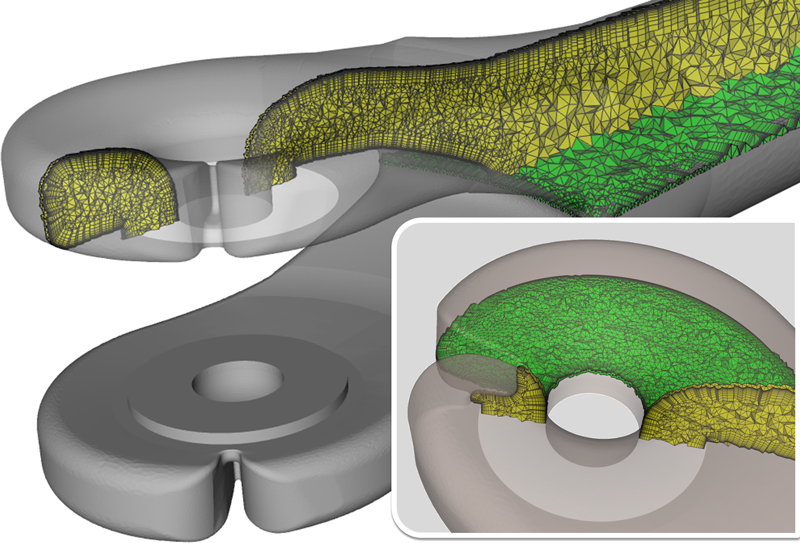 The robust nature of Pointwise and modular feature of CRUNCH CFD allowed our team to use a variety of meshing approaches for the LHSI pump. For the impeller (Figure 2), where cavitation could potentially occur on the blade surfaces, a hybrid unstructured mesh was created. Hexahedral cells were used to resolve flow near the blade. Downstream of the impeller, the diffuser section (Figure 3) was a full hexahedral mesh extruded from a 2D domain, while the leakage paths were hexahedral blocks extruded from 2D domains by rotation. A multi-block hexahedral mesh was also used for the collector (Figure 4). Connecting the collector and tank modules was the exit guide section (Figure 5), which consisted of curved vanes arranged in a periodic fashion. We generated the mesh for this component by first creating a hybrid unstructured mesh around one vane using the periodic domain feature in Pointwise. Then, the entire section was generated by copying the periodic mesh slice and revolving with the paste rotate command. 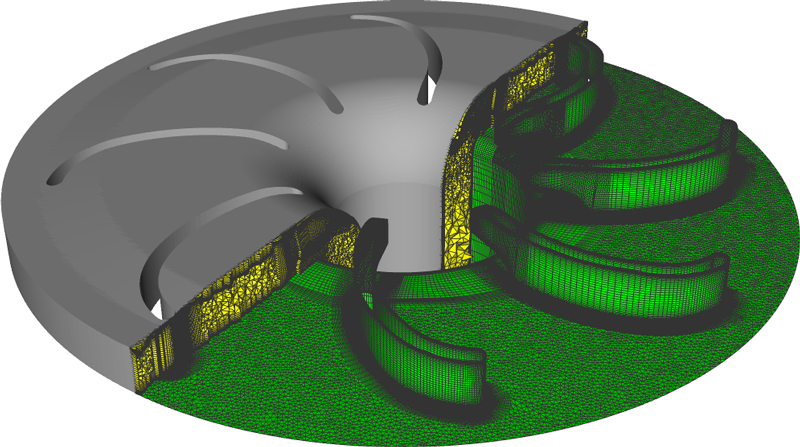 Figure 2: Impeller module created with hybrid unstructured mesh. Figure 3: Diffuser module created from extrusion of 2D domains. Figure 4: Collector module created with hexahedral blocks. Figure 5: Exit guide module created by revolving a hybrid unstructured mesh block. 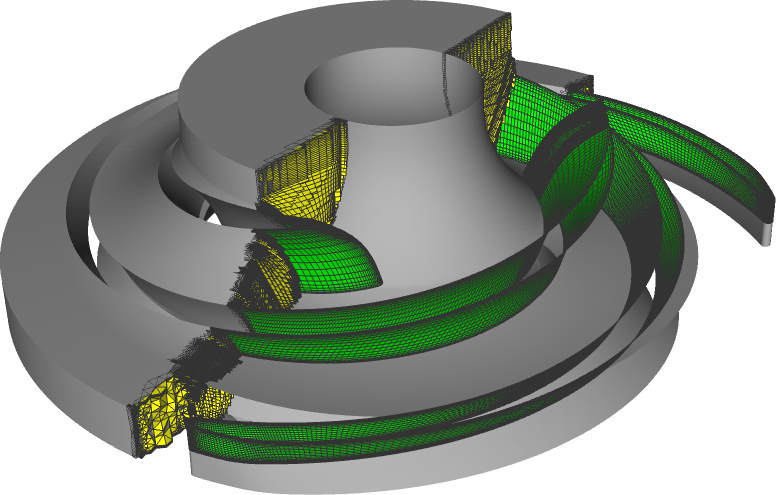 The two most challenging components from a meshing perspective were the inlet (Figure 6) and tank (Figure 7) modules. We decided to use T-Rex for these two modules because of the components' complicated geometries and the quick turn-around time required to evaluate multiple designs. Figure 6: Inlet module with inward-turning vane (zoomed-in view) created using T-Rex. Figure 7: Tank module with tight-clearance flange and flow windows created using T-Rex. One of the main challenges when working with a complicated geometry is resolving cells near viscous walls. CRUNCH CFD requires at least one layer of prism or hexahedral cells at viscous wall boundaries. This is where T-Rex's anisotropic tetrahedral extrusion really helped us generate high-quality unstructured meshes in a relatively short amount time. T-Rex proved to be quite effective at handling complex surfaces (Figure 6a) and walls with small clearances (Figure 6b). The solver settings allowed us to fine tune meshing at viscous walls with options to specify initial wall distance, growth rate, as well as extrusion layers and blend factors to isotropic tetrahedrals. 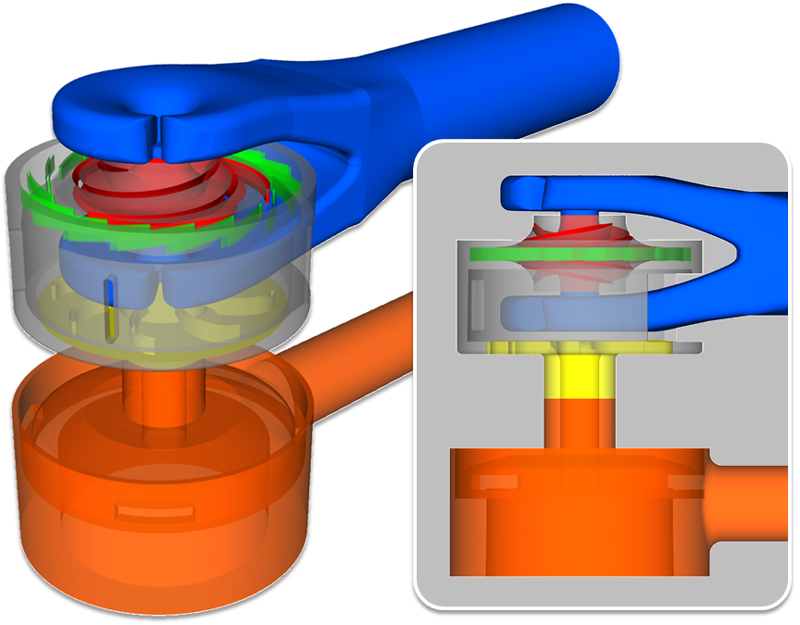 Our engineering team was able to quickly pinpoint the problem with the original pump design and evaluate alternative designs through computational fluid dynamics (CFD) simulation. Among the different designs, total cell count was maintained at 20 million for the seven modules. The grids created using T-Rex proved to be especially efficient when anisotropic tetrahedrals were combined into prisms during the Pointwise export process. This combination procedure reduced cell count by 60 percent while maintaining excellent grid resolution at viscous wall boundaries. Grid generation time for complicated geometry models also was reduced from days to hours with the aid of T-Rex. CRAFT Tech was able to take full advantage of Pointwise's powerful unstructured meshing capabilities. We used CRUNCH CFD's modular framework to separate a complicated centrifugal pump system into simpler components. This modular framework also allowed us to use different grid topologies for each component, thus improving the efficiency of the overall mesh while maintaining quality. The use of T-Rex in particular helped us streamline the meshing process.